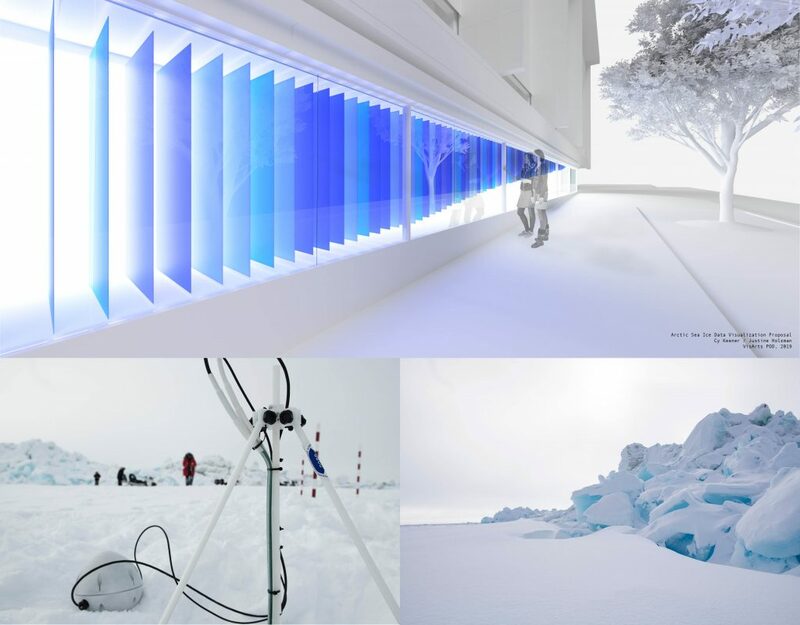 Top: Proposed installation of Cy Keener and Justine Holzman’s visualization and record of daily sea ice thickness data from locations in the Arctic Ocean at the VisArts 355 Pod Space. Bottom: Images of March 2019 deployment of Cy Keener’s specially designed buoys in the Arctic Ocean. Artist/designer/architect Cy Keener and landscape architect Justine Holzman will visualize data collected daily via satellite from specially designed buoys deployed in the Arctic Ocean to measure ice thickness and color. Set in a seventy-foot public window on a major thoroughfare with traffic volumes of over 60,000 cars per day, the 120-day interdisciplinary installation will span from peak ice thickness, through to little or no ice, chronicling the presence and absence of this precarious natural phenomena at a critical moment of environmental change. The 355 Pod Space is supported through a partnership between Federal Realty Investment Trust and VisArts.